Remote monitoring of crushing data from quarries is becoming a crucial element in mobile crushing and screening applications. Today, Metso offers complete fleet management and automation systems, designed for all Lokotrack range mobile applications. 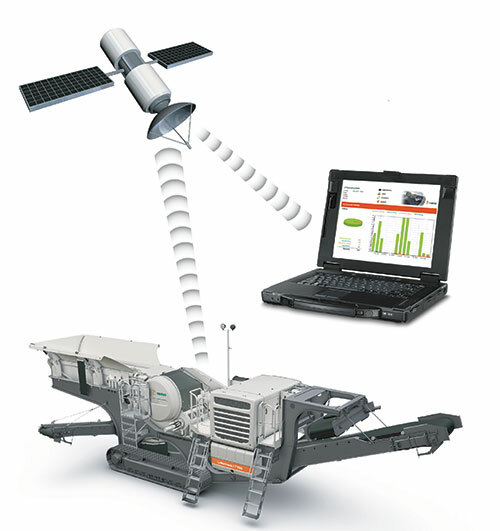 Metso Fleet Management system consists of an IC process control system, a satellite uplink and a Metso DNA Report portal. It collects and presents a daily overview of the operating Lokotrack fleet including effective operating hours, fuel consumption, location of the units, alarms and parameter changes. Metso IC process control system, a standard feature in all Lokotrack crushing plants, collects crusher data continuously. With the new fleet management tool, this information is being sent from Lokotrack uplink via satellite daily to be used in internet portal. The crushing data can be accessed via internet. "Without this system, collecting operating hours and other data manually is time consuming. There are also delays before the numbers are at your fingers and the data can be inaccurate. Metso Fleet Management provides daily operating data automatically wherever you are, saving time and enhancing the accuracy of information," comments Julius Mäkelä, Project Manager at Metso Mining and Construction. "Maintenance, ordering the spares and wears and re-fuelling can be organized in a more effective way when you know the exact fuel consumptions and operating hours of individual units. Here, the fleet management tool can provide valuable assistance," Mäkelä adds. Parameter changes have direct effect on crushing and screening process. Data and parameter changes are collected by the Metso DNA Report portal and data can be accessed anywhere using internet. In the Report portal, you can compare data between the units, days or weeks. Repeating alarms due to the misuse of the unit cannot be hidden anymore. Using the portal, you have the means to guide operators to use Lokotrack in a proper way and to preserve the value of your investment. Besides active product development, Metso has continuously developed new tools to ease customers operations and make those more profitable. In addition to the fleet management, Metso launched last year the ICr remote monitoring system for Lokotrack plants, providing wireless real time operating data and unit control to the excavator cabin for the operator. The ICr system improves working safety and comfort while the operator can adjust all basic crushing parameters without leaving the excavator cabin, using a handy colour display. For complete mobile plant automation, a Metso DNA automation system is available, featuring full process controls for feeders, crushers, conveyors, screens and hoppers. The system controls material feed rate, re-circulation and crusher loads, for example. Target values for automatic controls are given in a control room and they are gathered as production recipes that can be easily created, edited and uploaded by operators. The Metso DNA control cabin with its displays provides real-time process information and camera images. The first Metso DNA's for mobile and portable crushing plants have been already installed and are in operation at North European crushing contractors in demanding operation environment. The feedback thus far is very positive: plant automation secures a continuous production of high quality end products and makes the operating environment safer and more comfortable. Picture caption: Metso Fleet Management system collects and presents a daily overview of the operating Lokotrack fleet.